California's 12th congressional district is a congressional district in California. Speaker of the United States House of Representatives Nancy Pelosi, a Democrat, has represented the district since January 2013. Currently, the 12th district is entirely within the city of San Francisco. 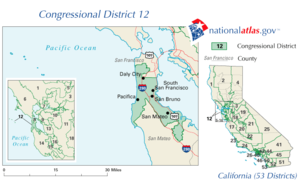 Prior to redistricting by the California Citizens Redistricting Commission of 2011, the 12th district consisted of portions of both San Mateo County and San Francisco. It is the smallest district by area outside of New York City. Richard Nixon, who would subsequently serve as the 37th President of the United States, represented this district from 1947-1951. Nancy Pelosi, the former 52nd Speaker of the House and current Speaker of the House, is the current representative of this district, after previously serving California's 8th Congressional district from 1993-2013. January 3, 1955 83rd Redistricted from the 9th district and re-elected in 1952. 97th Redistricted from the 17th district and re-elected in 1974. January 3, 1989 100th Elected in 1986. 110th Redistricted from the 11th district and re-elected in 1992. 112th Elected to finish Lantos's term. 116th Redistricted from the 8th district and re-elected in 2012. As of April 2015[update], there were five living former members of the House of Representatives from this district. The most recent death was that of Tom Lantos (served 1993-2008), who died in office on February 11, 2008. ^ California Constitution, Article 21, Section 1(c) (congressional districts), Section 2(f) (state government districts). ^ "Statement of Vote (2000 President)" (PDF). Archived from the original (PDF) on June 11, 2007. Retrieved September 17, 2008. ^ "Statement of Vote (2000 Senator)" (PDF). Archived from the original (PDF) on June 11, 2007. Retrieved September 17, 2008. ^ "Statement of Vote (2002 Governor)" (PDF). Archived from the original (PDF) on November 11, 2010. ^ "Statement of Vote (2004 President)" (PDF). Archived from the original (PDF) on August 1, 2010. Retrieved August 8, 2007. ^ "Statement of Vote (2004 Senator)" (PDF). Archived from the original (PDF) on August 10, 2011. ^ "Statement of Vote (2006 Senator)" (PDF). Archived from the original (PDF) on August 10, 2011. ^ "Statement of Vote (2006 Governor)" (PDF). Archived from the original (PDF) on August 10, 2011. ^ "Daily Kos Elections' presidential results by congressional district for the 2016 and 2012 elections". ^ "Congressional Directory: Browse 105th Congress". Archived from the original on February 17, 2011. ^ "1932 election results" (PDF). ^ "1934 election results" (PDF). ^ "1936 election results" (PDF). ^ "1938 election results" (PDF). ^ "1940 election results" (PDF). ^ "1942 election results" (PDF). ^ "1944 election results" (PDF). ^ "1946 election results" (PDF). ^ "1948 election results" (PDF). ^ "1950 election results" (PDF). ^ "2004 general election results" (PDF). Archived from the original (PDF) on August 21, 2008. ^ "2008 special election results" (PDF). Archived from the original (PDF) on July 3, 2008. Retrieved July 4, 2008. ^ "2010 general election results" (PDF). Archived from the original (PDF) on May 20, 2011. Retrieved February 21, 2011. ^ "2014 general election results". Archived from the original on December 21, 2014. Retrieved December 21, 2014.